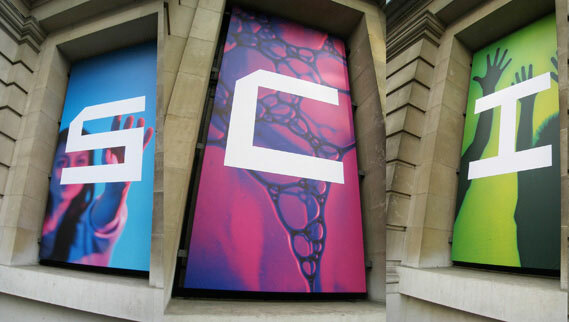 johnson banks was appointed at the end of 2009 to work on the Science Museum’s brand and identity. Whilst the museum is known for its groundbreaking exhibition designs, galleries and spaces, and remains one of London’s most loved museums, there was a sense that it could reach a wider audience, past its traditional family audience. For example, its monthly ‘Late’ nights have been amazingly successful, attracting thousands of twenty-somethings, drawn back to one of their favourite museums on a night when children are safely tucked up in bed. Coupled with a desire to reach out to a more clearly segmented audience and attract more ‘grown-ups’ the museum briefed us to search for a more sophisticated visual identity, to avoid the usual science clichés of test tubes and mad, white-lab-coated professors, whilst supplying more cut-through. We were also keen to find a visual style that was much more than just a logo and could plant the museum back in the minds of audiences who might have forgotten them. In identity terms the museum has lagged behind its London competitors – they had a simple wordmark and crest in the 80s which was slowly replaced by the ‘Sci M’ device in the late eighties (originally just meant as a shopping bag). This was dropped a decade ago in favour of a simple typographic solution but this had struggled for recognition, especially in the competitive environment of cultural posters on London’s underground. Neues Corporate Design für das Deutsche Historische Museum.